I know firsthand that it’s a great blessing to grow up hearing Bible stories. But too often, we can become so familiar with these stories, like David and Goliath, Noah and the ark, that we fail to see how the whole Bible fits together as one grand Story, the story of God creating and redeeming his people. When we don’t get this, the individual stories quickly become little morality tales, and we miss the forest for the trees. 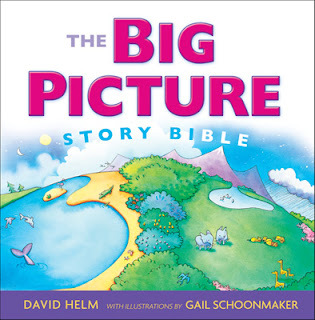 Enter the Big Picture Story Bible. I bought three books the week my son was born, and this was one of them (the other two will wait for later reviews). He’s now heard most of it twice. Simply put, this book is a huge hit at our house, and I think it will be for years to come. One of the coolest things about this book is the illustrations. More than just depicting the action in the stories, they actually underscore the book’s emphasis on the unity of Scripture. For example, when Israel enters the Promised Land, there’s an illustration that looks like an earlier one of Eden. The illustration for the Exile, when Israel has to leave the Promised Land, looks like the one where God sends Adam and Eve out of Eden. And there are many more parallels like this. This book is probably on about a 7-8-year-old reading level, but it’s really designed to be read to children. I look forward to reading it over & over with our kids and watching them appreciate how God has woven together his great story of redemption. Jake, Thanks so much for this review …. I am going to get this book tomorrow!! !